At some point last year I realized that my Japanese Maples were planted right in prime gardening real estate in the back yard. I dreaded asking Allan for help. He grumbled the whole time we were planting them several years ago. I told him I was going to move them to the front garden and I thought he was going to burst a blood vessel in his temple. When he went inside I grabbed the shovel and got to work. 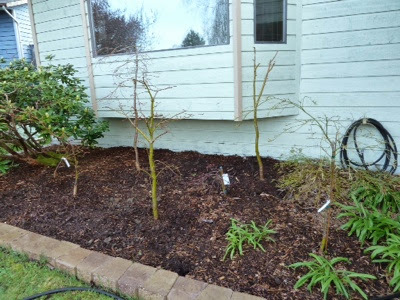 It took me about four hours to dig out the four maples and move them to the front garden. Three of the four holes where the maples were. 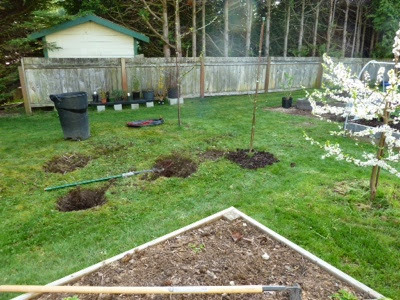 See those three fruit trees to the right of the holes. They are now called "My Orchard". 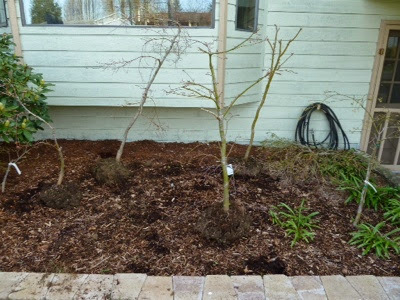 Here are the maples in the front garden sitting on the soil while I place them. And here they are...planted. I am so happy with how they look. I know they will be happier here. The soil in the back is rock solid clay. I am happy and oh so, so, so, so sore. Gardening is often hard work - but satisfying in the end. I take it that Allan didn't volunteer to help you ith the move...? It was more satisfying than I could have imagined. While a helping hand would have been wonderful, after moving five trees total, four of which were VERY heavy. I estimate one was about 100 pounds. And I did it. I got them dug out of the clay, dug another big hole in clay elsewhere in the he yard, and wrestled them into place. Five years ago, I was 100 pounds heavier, very bad back, knees and basically incapable of gardening. And now....I can relocate a grove of trees.....in clay. I think I can see why Allan wasn't supposed to help. I feel very good knowing I am capable!! The bed under the window looks rich and lovely. So, do I understand you now have an orchard? Missed a few posts the last week or so. Thank you Brenda!! My three trees in a row are now my orchard. It's meant tongue in cheek, yet I think more than two could qualify! !